Very rarely do we come across a comparison between two odd opponents who are not really meant to be competing; but, they still are fighting each other. One such example is the comparison of Google Go and Java. This comparison is interesting because both are doing the same thing with extremely different structures. The dilemma is because both have their pluses and minuses causing the developers to think twice before choosing one. 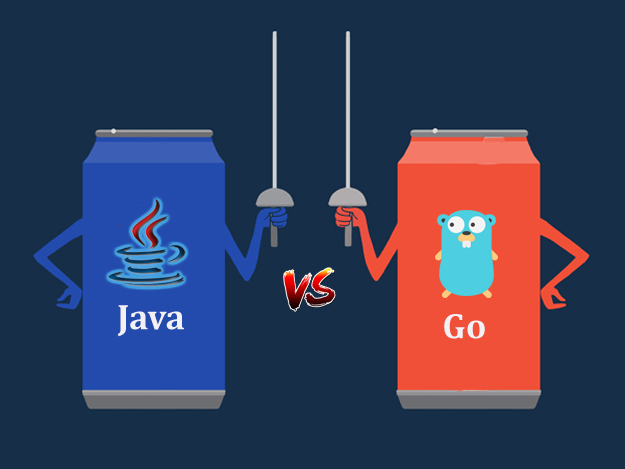 This blog will discuss the odds the make Go and Java compete successfully in the Java application development industry with share of loyal users who would think twice before migrating to the other technology. Java has been around for a long time and developers swear by it. It has built a credibility for itself over the years by meeting the expectations and continuously innovating. On the other hand, Go also known as Golang is a comparatively new invention which has rose to prominence because of its association with a brand like Google which is considered a technology giant. Another difference that might be of interest to developers is the compatibility factor. Java platform enables developers to use different programming languages for different aspects of Java application development. This lends a level of flexibility which is required by the developers creating complex apps. With Go, you do not get the advantage of using diverse programming languages. Besides the above mentioned differences, there are a variety of other differences like Java not requiring a lot of space, having tools that are easy to use and learn, creating constructs, etc. Go, on the other hand, has tools that are created for today’s developers with minimum effort requirement, the structures are simple and therefore, a lot of clutter is avoided. The factors that give Java an edge are the same factors that weigh it down in comparison to Go. For example, one of the most popular advantages of Java is the ease of finding codes through different mediums. And then, the fact that a version update causes some level of rework which is not always a trouble. But, when you have a programming language that is created with today’s technology in mind, why take the trouble of reworking. The Go experts argue that some benefits of Java are not well-used. Although, these benefits sound interesting; but, in reality they are rarely used. For example, using different programming language seems like a flexibility advantage but most of the developers who use Java do not know multiple programming languages and therefore, an advantage like this is rarely used. No sane developer would like to complicate the Software with using many programming languages. It would be safe to say that both Java and Go has their merits and it is on the developers to make a choice. Java with a mature platform, years of experience, and loyal developers has the required accolades to boast about. On the other hand, Go is a new venture which has been crafted according to the latest requirement and it has probably learnt from the challenges faced by Java. With both languages rendering a certain benefit, it is a difficult choice for developers.